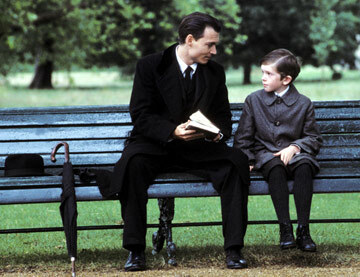 In today's jaded movie business, Finding Neverland achieves what so many films strive for - genuine emotion. This is a whimsical, heart-felt fable about the inspiration behind James Matthew (J.M.) Barrie's Peter Pan, similar to the way that Shakespeare in Love gave a fictional account of the making of Romeo and Juliet. It's also based on Allan Knee's play, but director Marc Forster (Monster's Ball, Everything Put Together) and adapter David Magee do such a good job that it never feels like a stage play transported to the big screen. Barrie (Johnny Depp, Secret Window, Once Upon a Time in Mexico) is coming off a theatrical disaster, and is looking for some new inspiration. He lives in a loveless marriage with his wife Mary (Radha Mitchell, Man on Fire, Phone Booth), and is prone to spending long amounts of time outside the house. One of these trips, he meets the Llewelyn Davies family. Sylvia (Kate Winslet, Eternal Sunshine of the Spotless Mind, The Life of David Gale) is trying to raise her four children after the death of their father. All of them instantly take to Barrie and his endless imagination except for Peter (Freddie Highmore, Two Brothers, Women Talking Dirty), who believes that all this nonsense is not worth the time. Barrie can see through this emotionall wall that Peter has, and wants to break through. Peter is still grieving over the death of his father, and feels that enjoying himself is not the right thing to do. Barrie spends his afternoons in far off lands with the Llewelyn Davies children, and Forster shows in quick flashes how the games that they play or the things that Barrie observes serve as inspiration for scenes in Peter Pan. There is something very odd about a grown man spending so much time with children, and everybody around Barrie notices this. This is all rubbish for Barrie, who is a child at heart. Forster and Magee never address this darker element in their film, but this is okay, since its inclusion would cast a very dark shadow over an otherwise innocent film. Moreover, they are not making a biographical film, but a film that takes Barrie's life as a starting point. Of course the eventual play is a hit, and everybody, Mary, the theater owner (Dustin Hoffman, I [Heart] Huckabees, Runaway Jury), and all of his detractors, are proven wrong. The final fifteen minutes are magical, and will elicit tears from most people. The conventionality of the rest of the film shows how strong the script is. Winslet does okay as Sylvia, who develops a small cough, and her outcome is obvious to anybody who watches period films. Forster doesn't call upon her to do much. Julie Christie (Troy, Harry Potter and the Prisoner of Azkaban) is utterly predictable as Sylvia's disapproving mother. Finding Neverland is about the relationship between Peter and Barrie, and Barrie's ability to slowly coax Peter out of his shell. It is a good performance for Depp, more subtle than some of his recent roles, and requires him to add lots of nuance into his performance (which he does). Highmore is the real surprise. He seems to have more depth than most other child actors, and is able to milk a surprising amount of emotion out of his lines, especially in the closing moments of the film. 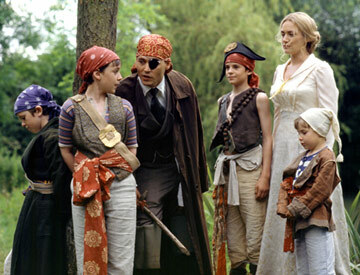 In fact, Depp requested Highmore specifically for his next film, a remake of Charlie and the Chocolate Factory. 1 hour, 46 minutes, Rated PG for mild thematic elements and brief language.